It’s 4:20 p.m., which means Tesla CEO Elon Musk might be tweeting. 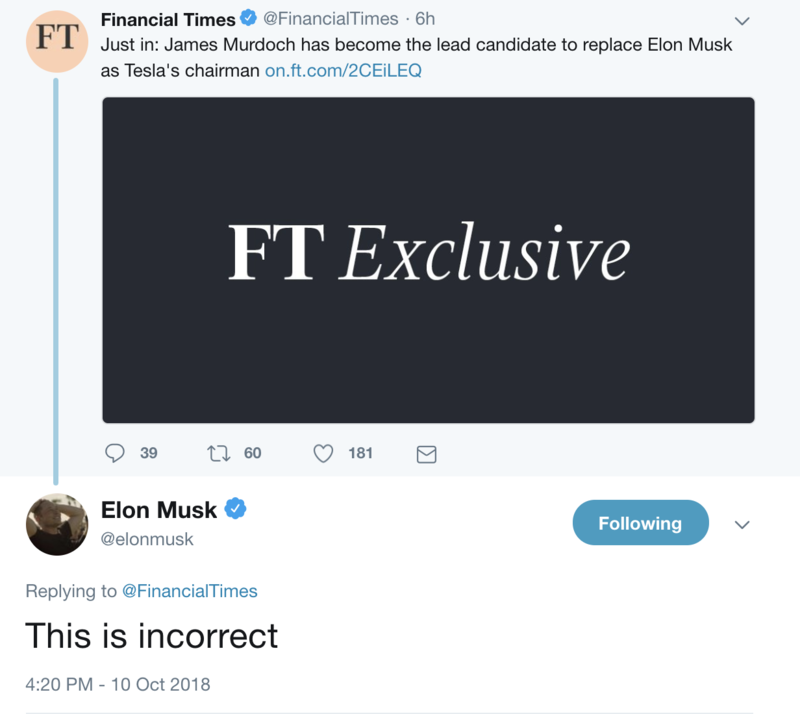 This time, the billionaire entrepreneur’s tweet debunked a Financial Times article from Wednesday that reported Twenty-First Century Fox CEO and Tesla board member James Murdoch was the lead candidate to take Musk’s chairman spot. Musk agreed in a September 29th settlement with the U.S. Securities and Exchange Commission to step down as chairman within 45 days. Musk, who didn’t not admit wrongdoing under the settlement, was also fined $20 million. Tesla was also fined and the company agreed to other conditions, including adding two independent board members. The FT report, which cited unnamed people who were briefed on the chairman discussions, also noted Musk favored Antonio Gracias, Tesla’s lead independent director. Musk was reportedly advised that Gracias may not be considered independent enough. The Musk tweet was sent at 4:20 p.m. PT, which is obviously a complete coincidence and has absolutely nothing to do with marijuana or a “wink wink nudge nudge” reference to what kicked off the SEC investigation and securities fraud complaint. The SEC complaint alleged that Musk lied when he tweeted on August 7 that he had “funding secured” for a private takeover of the company at $420 per share. Federal securities regulators reportedly served Tesla with a subpoena just a week after the tweet. Investigations can take years before any action is taken, if at all. In this case, charges were filed just six weeks later. According to the complaint, Musk calculated the $420 price per share based on a 20 percent premium over that day’s closing share price because he thought 20 percent was a “standard premium” in going-private transactions. This calculation resulted in a price of $419. Musk stated that he rounded the price up to $420 because he had recently learned about the number’s significance in marijuana culture and thought his girlfriend “would find it funny, which admittedly is not a great reason to pick a price,” according to the complaint. The judge presiding over the agreement has asked the SEC and Musk to submit a letter by Oct. 11 before approving the settlement.